Toronto to San Diego or San Francisco, California - $245 CAD roundtrip including taxes | September 2016 to August 2017, wide availability! Delta has dropped the price of their 1-stop flights from Toronto to San Diego, California down to $339 CAD roundtrip including taxes. UPDATE @ 2 PM EST: Prices have dropped to $245 CAD roundtrip including taxes! And now San Francisco is available too! This is 49% below the typical best roundtrip prices between Toronto and San Diego or San Francisco. 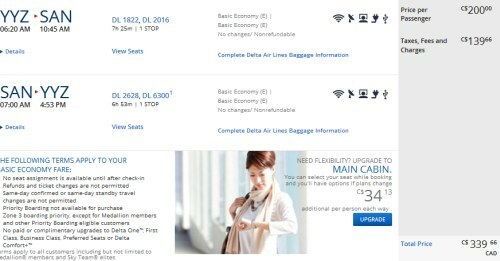 If you already booked your flight with Delta, you can cancel and rebook with no charge. Go to the Delta cancellation info page. Late September 2016 to early August 2017. Wide availability! There's even one date combination that happens to surround Comic Con dates (try July 19 to 25). Or July 11, 12, 13 to July 18. Or July 26 to July 31 or Aug 1. For dates in early August 2017, see below. There's not really a bad month to visit San Diego. It has a great climate all year round. For dates between May 2017 and August 2017 - see the paragraph towards the bottom of the post. The best months to visit San Francisco are from March to October. How about flying into SAN FRANCISCO and home from SAN DIEGO (or vice versa), with an amazing road trip in between? That's possible too. Scroll down for details. Update @ 2 PM EST - Prices have dropped to $245 CAD roundtrip including taxes! And now San Francisco is available too! 3. Try other dates between May 2017 and August 2017. Returning August 11th, 2017 is the furthest date away that the price is available. 4. Click through from Kayak to the Delta website. These are also available in reverse, if you know anyone in San Diego or San Francisco that would like to visit Toronto. 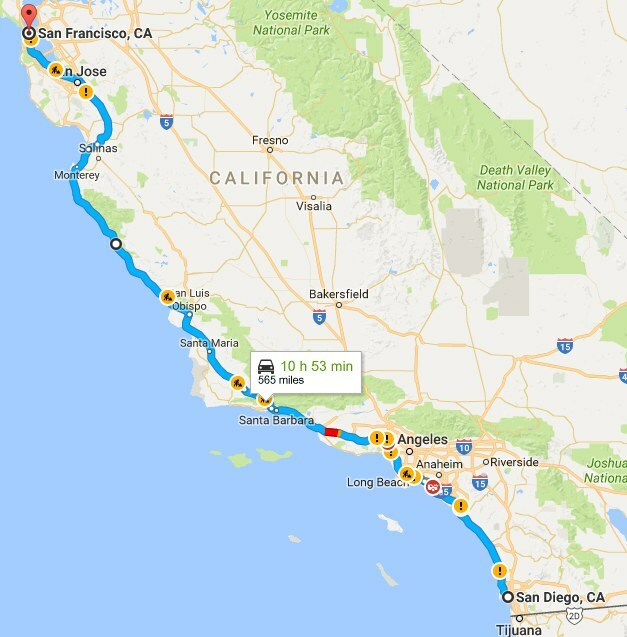 How about flying into San Francisco and home from San Diego - with an epic road trip down the coast in between? Yes, that's possible too. The price is the same ($245 CAD roundtrip including taxes). 2. Click on the departure date box to try other dates. 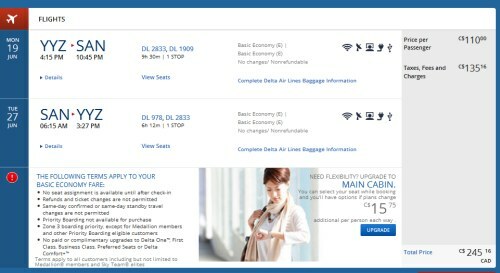 toronto, yyz, flight deals, united states, delta, california, north america, san diego and san. 6 Responses to "Toronto to San Diego or San Francisco, California - $245 CAD roundtrip including taxes | September 2016 to August 2017, wide availability!" Thanks!!! I just booked my December trip for $245!!!! It's probably gone back up in price by now. If you sign up for the alerts, you will see these deals as soon as they are released, instead of being too late.